Tod’s Tasties Cafe is one of our very favorite breakfast spots. Tucked away in historic Montford, it’s well-hidden among the big trees and beautiful Victorian houses. We decided to swing by for breakfast after an early morning (who are we kidding, early afternoon) workout last Wednesday. Part of what makes Tod’s so great is it’s unpretentious nature. Looking at it from the street, you’d never know how insanely good the food is. Tod’s, like many other Asheville eateries, is largely sourced from local farms and utilizes fresh seasonal ingredients in their recipes. Everything served is made from scratch. What’s more, breakfast is served all. day. long. You order at the counter, which is great because you can look over the rockin’ pastry display. Be sure to check out the extensive daily beverage offerings. They also have a pretty good beer and wine selection if you’re looking for something a little stronger. There’s a few seating options: an indoor dining room, a covered patio, and an outdoor terrace. We decided to sit outside and enjoy the beautiful weather in sunny Montford. It’s seriously hot in Asheville right now, but we try to avoid cooling off with a beer before 1 p.m. (most days). Instead, we opted for an iced latte (for Chelsea) and a cold brew (for Mattie). The coffee is perfectly flavored and reasonably priced to boot. Mattie decided on “The Spin”, eggs with fresh chèvre and spinach on a bagel. She’s a bit of a bagel addict, and Tod’s makes theirs from scratch with NC-produced organic flour. As delicious as it looks! She also got a side of fresh fruit. It’s always a bit of a risk ordering fruit, regardless of season…we usually feel like you end up with a few bland melon chunks with some grapes tossed in. Tod’s is the exception–big slices of peaches, oranges, grapefruit and pineapple. It tastes exactly like summer. Chelsea went for “The Big Poppa”, a monster of a sandwich loaded with sausage, fried egg, and muenster cheese. It’s traditionally served on a bagel, but she asked for a biscuit instead which added a little Southern twist. Tod’s is somewhat known for their tater tots, so of course we got an order of those as well. 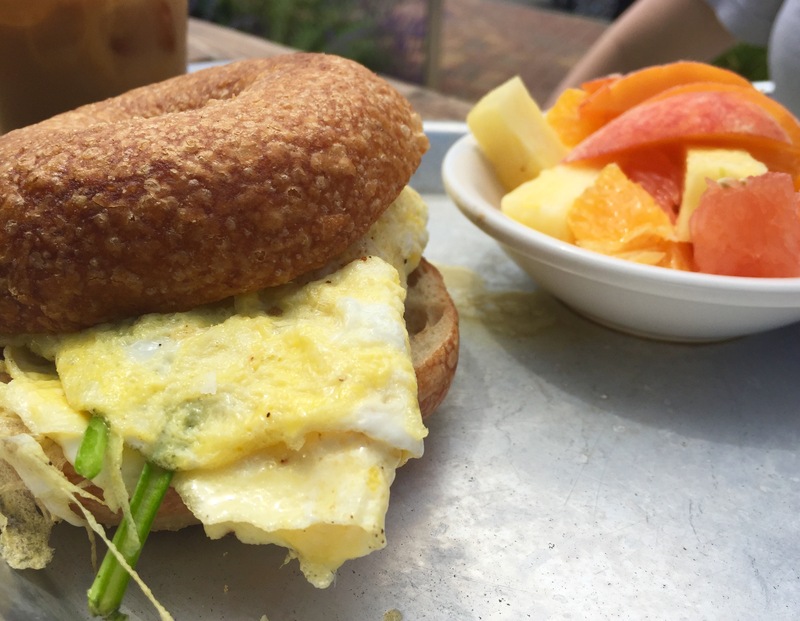 If you’re looking for a breakfast joint in Asheville, you really can’t go wrong with Tod’s. Great environment, good prices, and delicious food…10/10 would eat again. Man oh man those sandwiches look INCREDIBLE!! I’ll have to try that place when I come visit Asheville. Great blog, keep it up! Sadly I have never been, & it looks like I gotta check it out! Great post ladies!!! So excited to see a food blog for Asheville!! I live about an hour away and always have trouble picking out places to eat when I visit. This blog will be super helpful for my future trips up the mountain! Thanks ladies! Caught your blog & checked out Todd’s may I say brilliant. We ordered both of what you recommended but Todd’s a pastry freak and oh so excellent. Thanks ladies great job! !